The safest banks in emerging markets continue to be concentrated in a small number of countries. 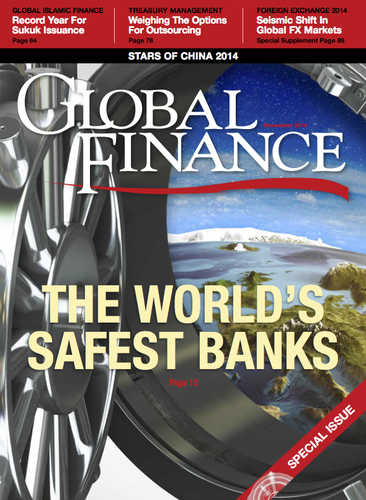 Whereas 21 countries contribute banks to Global Finance’s ranking of the Safest Global Banks 2014, only 10 contribute banks to the ranking of the 50 safest banks in emerging markets. The distinction is driven by the small number of emerging markets countries that enjoy high sovereign credit ratings, which in turn open the way for high ratings on their banks. Banks in countries with low sovereign credit ratings are effectively barred from receiving high ratings, even if they are strong on a stand-alone basis, owing to the danger that crises at the sovereign level could lead to failures of individual banks. South Korea and Saudi Arabia each contribute nine banks to the Safest 50, China contributes 8, and Taiwan and the UAE six each. These five countries therefore account for more than two-thirds of the Top 50. Chile continues to be the only Latin American country to contribute banks to the Top 50, despite recent rating upgrades to banks in Mexico and Peru. Four Chilean banks are included in the Top 50, the same as last year. The Czech Republic is the only country from the region comprising Central and Eastern Europe and former Soviet Union to contribute banks to the Top 50. National Bank of Abu Dhabi (NBAD) again heads the rankings of the safest emerging markets banks, with AA- ratings from each of the three major credit rating agencies—it is the only emerging markets bank to achieve this. NBAD ranks 25th in Global Finance’s Top 50 Global Safest Banks ranking. NBAD is followed by nine other banks that each have two AA- ratings and one of A+. The second-, third- and fourth-ranked banks are all Chinese; the next three and the ninth-ranked are South Korean. National Bank of Kuwait ranks eighth, and Chile’s Banco Estado, tenth. One A rating and two of A- (worth 13 points) suffice to assure inclusion in this year’s emerging markets list, with a score of 12.5 enabling two banks to qualify in 49th and 50th places. Four other banks score 12.5 but are ranked outside the Top 50 based on their asset size: Poland’s Pekao, Taipei Fubon Commercial Bank, Qatar Islamic Bank and Suhyup Bank from South Korea. Five of the six GCC states have banks in the Top 50. Qatar (with three), Kuwait (with two) and Oman (with one) join Saudi Arabia and the UAE, leaving Bahrain as the only GCC state without a representative, although Bahrain’s Gulf International Bank comes close, with 12 points. The regional list for emerging markets in Asia displays the dominance of Chinese and South Korean banks, which account for nine of the top 10 banks. Bank of Taiwan is the only interloper, in eighth position.As with the global list, no sub-Saharan banks other than those from South Africa come close to scoring highly enough for inclusion. The eligibility criteria and scoring mechanism for the Safest Emerging Markets Banks are the same as those used for the global list. Banks must be among the biggest 500 in the world, ranked by assets, and they must be rated by at least two of the three major credit rating agencies. A sub-investment-grade rating from any of the agencies bars inclusion, regardless of the level of the other ratings. Eligible banks are then scored, with 10 points being awarded for an AAA rating (though no emerging markets bank carries such a rating) to 1 for BBB-. When a bank is rated by only two agencies, an implied score for the third rating is calculated by taking the average of the other two and deducting one point. We include regional lists only for those regions where the list differs from that of the global rankings (Asia, Middle East, Africa).